Mike and I received one of those fancy electric fondue pots as a wedding gift. We've used it maybe three times in as many years. It's not that I don't LOVE chocolate fondue (because I do), it's just that there is too much work involved. You have to fill it with enormous amounts of chocolate, it takes forever to warm/melt to the right consistency, and then cleaning up is a pain in my currently-rather-pregnancy-enhanced-behind. Chocolate pouch, warmer, and food for dipping! 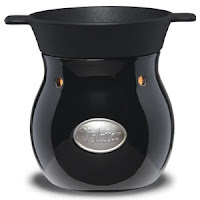 This is how my nights have looked since receiving my Noir Velata warmer: plug in warmer, melt chocolate, pour into silicone dish, enjoy, rub super-full belly, put silicone dish in dishwasher, DONE. No waiting for an hour for chocolate to melt, and no annoying clean up. If you don't use all of the chocolate in the dish, you can simply take it out once it hardens, put it in a plastic bag, and refrigerate until you use it again! Each pouch contains about 6 servings of chocolate. Each warmer comes with 4 fondue forks. The forks and the silicone warming dish are dishwasher safe. People said it couldn’t be done. How could you take something as complicated as fondue and make it simple? In a flash of brilliance, it struck them. A small group of clever, chocolate-adoring Scentsy folks had a dazzling idea. What if we served scrumptious chocolate fondue in a plug-and-play, fun-to-use warmer worthy of such fine chocolate? Perfect chocolate needs a perfect melt! So we invented a patent-pending silicone dish heated by a light bulb in a hip, fun, smart fondue warmer. Who else but Scentsy could find a hip, fun, smart way to use a light bulb? Whether you are a foodie, a trendsetter, or just someone who thinks of chocolate as its own food group, Velata fondue products are for you. Check out the fun warmers and to-die-for chocolate at Sandy's Velata website! With milk, dark, caramel, and white chocolate options, there is something for every chocolate lover. I am personally teaming up with Sandy to offer a Noir Velata warmer (the one that I have) and one pouch of chocolate (you can choose either Dark or Caramel) to one of my readers! This is a Rafflecopter giveaway. Click "Read More" below and then follow the instructions on the widget. Make sure to click "Enter!" after you complete each entry. All currents count! The giveaway is open to US Residents only and ends at 11:59 PM on Wednesday, June 27th. The first entry is mandatory - Visit Sandy's Velata website and leave me a comment telling me which warmer you like best and what chocolate you'd like to try! Once you complete this entry, the widget will give you the option of completing the rest. Complete more steps for more chances to win!